It takes me about 10-15 hours to write a sermon that I would consider “decent.” That’s 15 hours invested in delivering a 30 minute sermon. It is common knowledge that most people will forget most what was said, except for perhaps one thing, one comment, one verse that resonated with them. I found this concept to be very frustrating, until I realized that if I sought to use the material in a different way, repackaged it, I could reuse the work and investment of time in multiple ways. I could prepare the message, post it on a web site where millions potentially could hear it, write devotionals from the same material, break it up for blog entries, and on and on we could go. The possibilities are limited only by my imagination. 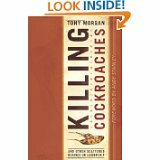 This principle of recycling has been re-confirmed in my mind when I read Killing Cockroaches by Tony Morgan. The book is the printed version of his blog. He simply cut and pasted his short blog entries into a book format. He didn’t even bother to group them together or arrange them in any order. So what you get is over 200 blog entries given one after the next. It’s so simple it’s Â brilliant! There are people who may not know about his blog or even follow blogs, but they will go into a book store, see his book, and pick it up. He didn’t have to invest any time (ok, not much time) to write a book, because he had already done so with his blog entries. Morgan says, “As that was occurring, I realized that many people, possibly those who needed it most, weren’t getting the daily jolts of strategy insights I was sharing about ministry, leadership, and life. My blog readers, including a few thousand die-hard subscribers, were having fun and engaging in the dialogue. Others, however, including many who still think blogging is a bad diesase, have been left out of the conversation.” (p. 2) There are people out there that need to hear what you have to say, and read what you were destined to write. How can you get your God given message out there in different ways? So don’t throw anything away. Recycle it!